My first piece of advice is DON’T RELY ON THE LOTTERY. Get your tickets for the Hamilton musical now, which is currently playing at the San Francisco Orpheum Theatre through August 5, 2017. 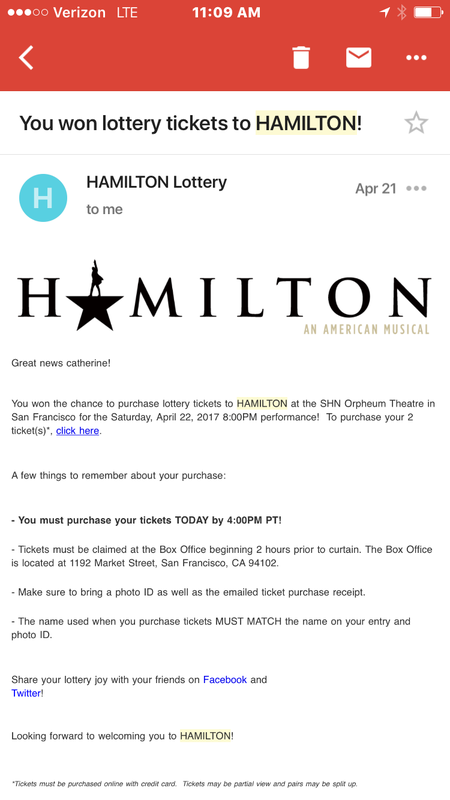 I wrote a post on buying tickets here. I can tell you that, whatever price you pay, the show is worth it. Give up your Starbucks addiction for a month. Skip a couple therapy sessions. Rent your apartment for a weekend while you go camping. Don’t miss out on this incredible musical, which I consider to be my favorite, and a notch above Wicked which I absolutely adore. The first thing I did was purchase tickets. Once I was committed to the show, I moved forward with entering the lottery. Enter in your details and always select 2 tickets vs 1 ticket. Because…why not?! Set a reminder for yourself and enter every day. The show isn’t 7 days a week, but setting a daily reminder got me into the routine so that I never missed an opportunity. 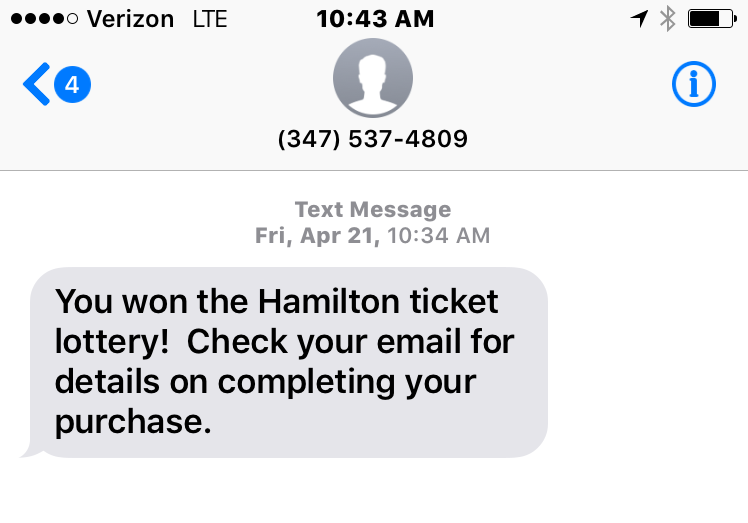 If you live in NYC or Chicago, there’s the Ham Lottery app that makes it super easy. 2. Enter for yourself and for another. Enter and submit for yourself. Then do it again for your best friend or spouse or family member or as many people you know who have an email address who are willing to take you as their date. This also increases your chances. Let your friends and family know that they will start getting emails that read: Thanks for entering! You should get your results email the day prior to your performance. Remember to come back again to enter for future performances. Good luck! 3. Don’t throw away your shot! The probability of winning the lottery is low, but I persisted and my diligence paid off. A little bit of luck was also involved, I’m sure. Plus we won tickets for the show on my husband’s birthday. What are the odds?! 4. Here’s what to expect when you win. Wishing you all the luck on the lottery. But remember: buy tickets. Give yourself the gift of inspiration. I can’t believe you won – that is amazing! I’ve tried for the lottery both times I saw it in NYC, but no luck. I’ve entered the Wicked lottery multiple times as well – nothing. But if I lived in NYC, I’d be entering the lottery every day! 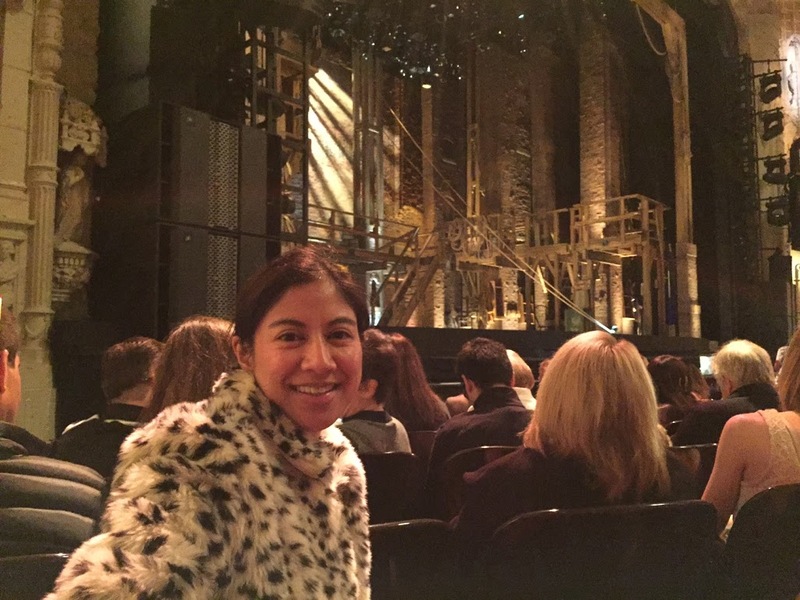 Dana, I still remember your post on Hamilton and I was so giddy as I saw the pictures of you with the cast. Like OMG!!! That’s so awesome. I definitely believe in entering contests and I will enter daily to give myself a better chance. I figure it only takes a second and you never know. I usually enter that HGTV home sweepstakes but I didn’t this time around because I know I won’t be here when they do the drawing. I actually had that thought process that I COULD win, which is hilarious, but like I said you never know. You have to see Hamilton! Coming to LA very soon. Very cool. Happy that you got to see it. 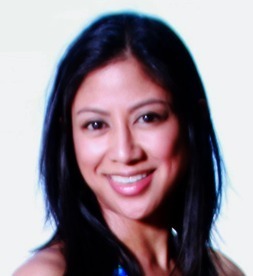 Very good info! I will happily skip my therapy for a month to pay for this! Cassidy’s parents went last month and they said their lives were changed. Yes! I feel so inspired by Hamilton.